Getting power to the main panel and sub-panels in your house. Power to your site needs to be installed by the electrical utility company. You can request either an above ground wire from a pole or an underground feed. You should definitely choose the underground feed. Depending on circumstances it may even come out to be about the same price, and it's certainly more robust, less ugly, and less general hassle. With an underground feed the utility company will provide the wiring all the way to the electricity meter (which is not the case with an overhead feed). The utility company will install a transformer near the edge of the street in a big green box on a concrete pad. These transformers make an annoying humming noise so it is best to try to get the utility company to position it out of ear shot relative to where you typically like to sit in your yard. The job of the transformer of course is to take the high voltage that the utility company uses for distribution and change it down to the 120/240 volts that your house needs. From the transformer, wires run underground in conduit (assuming an underground service) to an electricity meter that is typically positioned on the outer wall of your house at a height of about 5 feet (to allow easy reading). An important consideration is that the electricity meter needs to be physically close to where your main panel is (that has the main breaker). If the meter is on the outside of your garage wall then typically the electrical panel will be on the inside face of that same wall in the same location so that the link between the two is only the wall thickness. If you are mounting your electricity meter free standing outside then that means your electrical panel will also be outside as part of that same arrangement. This is perfectly ok, but in practice it means that you will probably install sub-panels inside your house that are fed from the outside main panel. In my case the main panel feeds two 200 amp sub-panels (that our mounted in the basement) from the 600 amp main panel that is outside. The "Service Entry" wires from the adjacent meter box come into the main panel and the two live wires go directly to the main breaker. In my case it is a 600 amp breaker because I have a 600 amp electrical service from the utility company. 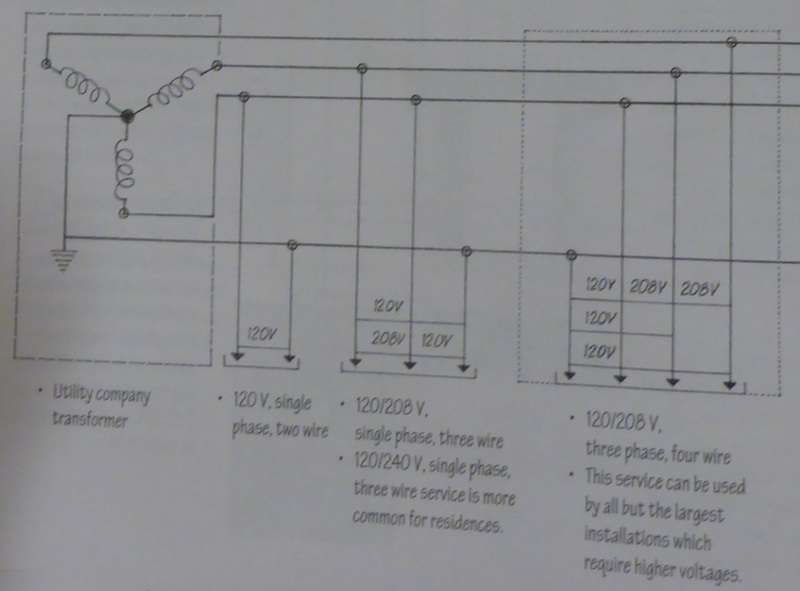 Note that each live wire in the picture below is actually 2 wires in order to be able to handle the high current. The neutral wire (again actually two wires in parallel to handle the current) is routed to the Neutral plate that (in my case) is in the bottom half of the main electrical panel. In the case of a "Main panel", the neutral plate/bus also needs to be connected to earth. This means it needs to connect to big copper stakes that are driven into the ground and it also needs to be connected to the metal enclosure that houses the main electrical panel. In the picture above you can see the wire with green tape round it that goes to the metal case and the bare copper wire that goes to the stakes in the ground. The rest of the connection block is for attaching all the neutral wires for all the feeds that you want from the electrical panel. In the picture above there are only two neutral wires as the main panel is currently only feeding two destinations (two sub-panels). The live connections for feeding off to whatever you want to power are connected via breakers. Out of the bottom of the main breaker come two thick metal bus strips. These are Live1(L1) and Live2(L2). The breakers attach to these live busses. In the case of wanting 110V power then the a single breaker that just attaches to one of the live busses is used. If you want 240V then two breakers ganged together are used (one breaker on L1 and one breaker on L2). Breakers come in different current ratings and different physical sizes. In the picture there are three 240V breakers each capable of 200 amps (that are used for powering sub-panels) and there are a number of smaller breakers that range in current from 20 amps to 100 amps. My main panel happens to be a GE "A Series Panel". It takes breaker type "THQB" available from http://www.galesburgelectric.com . Even though your house power will come from sub-panels, having the smaller breakers (eg 20 amps) in the main panel can be useful for powering various things in your yard. The wires from the main panel to the sub-panels in your house need to be good thick wire. The minimum for handling 200 amps is called "2/0" but if you can afford it it's better to use even thicker gauge wire. The reason for using as thick as possible is that you want to minimize the voltage drop that you will get in the wire when everything in your house is turned on. It is really annoying to have your lights dim when someone turns on a hair dryer or an electrical heating appliance. Obviously the thing pulling in the other direction is the fact that thick gauge copper wire is very expensive. One of the nice things about the luxury of having two 200 amp sub-panels in the house is that you can use one for your heating appliances and use the other one for your lights and other low current appliances such as assorted electronics. This will avoid the lights varying in brightness. There is however a slight building code worry about having two separately fed sub-panels in your house. Building code says you can only have one service entry feed to a residential house, but if your main panel is outside in the yard this does not by the letter of the law contravene this rule because your main power cutoff is the switch in your yard. It is though a little worrying because two sub-panels means that the user needs to turn off two switches to cut all power from the building. If you do use two separately fed sub-panels then it would be wise to mount them next to each other and put permanent labels on the switches to make sure it is clear that there are two switches that need to be turned off. The thing that is an even higher factor in picking the brand of panel may well be price of AFCI breakers in go into it given that AFCI is needed on almost all 15 and 20 amp circuits. As it happens, the Siemens AFCI breakers are as low cost as they come (which at $35 each is still expensive). In my main house the sub-panels are mounted in the basement garage area on the eastern end of the garage north wall.